That new model has arrived, and it’s based on the concept of an app-coin or token (these terms are interchangeable): a scarce digital asset based on underlying technology inspired by Bitcoin. These tokens now have a collective market cap of billions and climbing. The most important point of difference that often confuses participants new to the cryptocurrency space is that tokens are not equity, but are more like paid API keys. In this model contributors don’t measure the attractiveness based on cost of equity, P/E ratios and the like, but on the basis of the future usefulness of the product, number of tokens in circulation (and future inflation/deflation of this number), necessity of the token to the products functionality and the opportunity for capital gains. 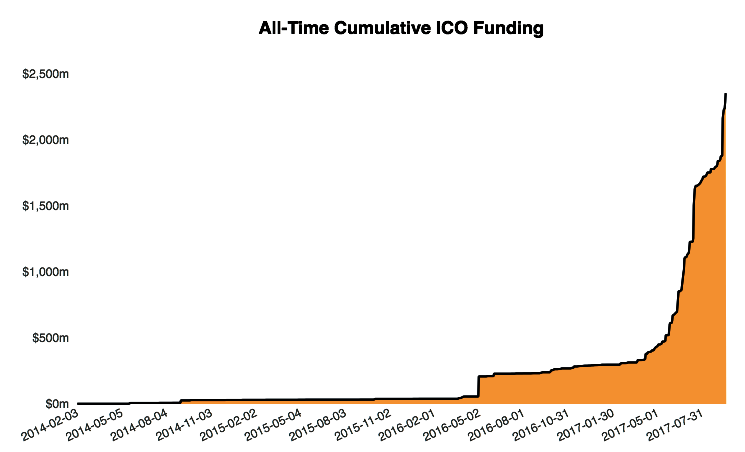 The rationale behind ICO funding is that once a product launches and acquires users, demand for its token will increase dramatically, causing token values to rise to the benefit of their holders. Pre-sale participants are often further rewarded with additional bonuses on their token purchase to compensate for their additional exposure. 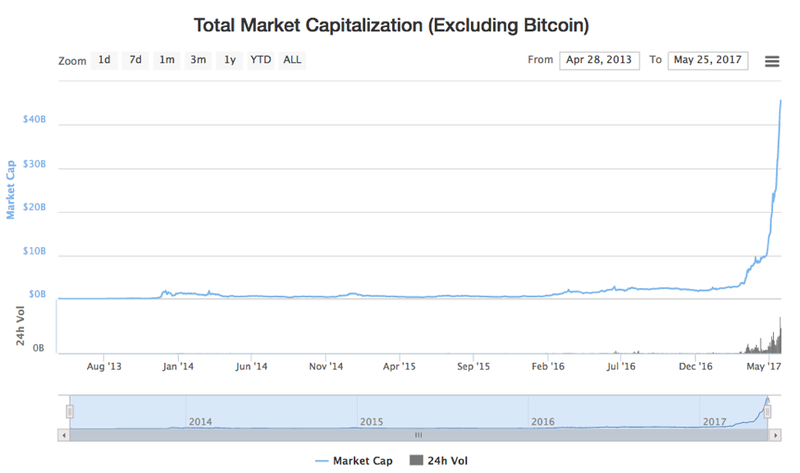 The chart below illustrates the value of non-bitcoin token values, and illustrates the parabolic rise in capital values the above model brings about. ICO (Initial Coin Offer) is the term used to define a process of raising funding for some particular project. Only instead of traditional shares, the participants get coins for their contribution — certain electronic tokens (blockchain entries), confirming the investor’s stake in the project and consequently the investor’s share in the profit from the project. In other words, A-coins are issued for Project A, B-coins are issued for Project B, and so on. Coins, have value only within the scope of a certain project. So, coins for Project A do not affect coins for Project B. A token launch differs from an equity sale — the latter is regulated by the 1934 Act, while the former is more similar to a sale of API keys. While equities can only be sold in the US to so-called “accredited investors” (the 3% of adults with >€1 million in net worth), the US could not restrict the sale of API keys to accredited investors alone without crippling its IT industry. Thus, if tokens (like API keys) can be sold to 100% of the American population, it would represent an increase of 33x in the available US buyer base relative to a traditional equity financing for a US start-up. Token launches are typically international affairs, with digital currency transfers coming in from all over the world. New bank accounts receiving thousands of wires from all over the world in minutes for millions of dollars would likely be frozen, but a token sale paid in digital currency is always open for business. Given that the US is only ~4–5% of world population, the international availability provides another factor of 20–25X in the available buyer base. A token has a price immediately upon its sale, and that price floats freely in a global 24/7 market. This is quite different from equity. While it can take 10 years for seed investment equity to become liquid in an exit, you can in theory sell a token within 10 minutes — though founders can and should cryptographically lock up tokens to discourage short-term speculation. Whether or not you choose to sell or use your tokens, the ratio between 10 years and 10 minutes to get the option of liquidity is up to a 500,000X speedup in time, though of course any appreciation in value is likely to be larger and more sustainable over a 10-year window. This huge liquidity premium alone would cause tokens to predominate whenever they are legally and technically feasible, because the time to liquidity enters inversely in the exponent of the compound annual growth rate. Fast liquidity permits users to participate in new token offerings, permitting faster growth. Because token launches can occur in any country, the importance of going to the United States in general or Silicon Valley / Wall Street in particular to raise financing will diminish. Silicon Valley will likely remain the world’s leading technology capital, but it will not be necessary to physically travel to the United States as it was for a previous generation of technologists. Large technology companies like Google and Facebook offer extremely valuable free products. Despite this, they have sometimes come under fire for making billions of dollars while early adopters only receive the free service. The token launch model will provide a technically feasible way for tech companies (and open source projects in general) to spread the wealth and align their user base behind their success. This is a better-than-free business model, where users make money for being early adopters. Tokens will break down the barrier between professional investors and token buyers in the same way that the internet brought down the barrier between professional journalists and tweeters and bloggers. The internet allowed anyone to become an amateur journalist. Now, millions of people will become amateur traders. As with journalism, some of these amateurs will do extremely well, and will use their token-buying track-record to break into professional leagues. Just like it eventually became a professional requirement for journalists to use Twitter, institutional investors of every size from seed funds to hedge funds will get into token buying. New tools analogous to Blogger and Twitter will be developed that make it easy for people to use, buy, sell, and discuss tokens with others. Because token buyers need only hold private keys to guarantee custody, it changes our notion of property rights. For tokens, the final arbiter of who possesses what property is not a national court system but an international blockchain.